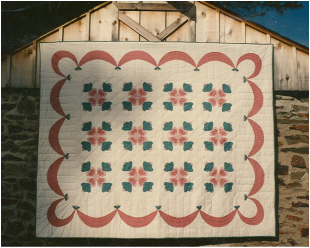 ﻿The Newtown Quilters' Guild (NQG) began in June, 1989﻿ when a group of ten friends gathered together for an evening of sewing and socializing. This was the beginning of a monthly "stitch 'n sew" that would be held in various homes in Bucks County. At first, there wasn't an organized activity and many crafts were shared. As word spread and more joined this group, quilting was the one craft that interested everyone. By November of that year, the group numbered 33 and quickly outgrew family rooms. Since then, the NQG devised its name, logo and weathered various moves as the membership grew to 100 with members coming from Bucks County, Montgomery County, Philadelphia and New Jersey. The NQG meets at 7:00 pm on the third Tuesday of every month at the Lower Makefield Township Community Center in Yardley. Our meetings usually consist of a speaker or a demonstration. The June meeting is our birthday month and it has become our tradition to celebrate with strawberry shortcake. The October meeting is our annual dinner. There are usually no speakers at these meetings. Guests are welcome to all meetings, except for the October and December meetings. There is a $5.00 fee for guests unless otherwise noted (this information can be found under Events on the website). We welcome quilters of all experience levels to join. Even if you are not a quilter and would like to become one, please feel free to come to join us. In addition to our monthly meetings, a raffle quilt is created yearly to help raise funds to support the guild. The ticket is drawn for this quit at our October dinner meeting. In odd numbered years, the Guild hosts their annual quilt show and in even numbered years, members participate in a quilt challenge.